Home » Academics » Schools » School of Science, Engineering and Technology » Faculty » Jose Tormos Melendez, Ph.D.
Jose Tormos Melendez, Ph.D., received a B.S. in Chemistry from the University of the Sacred Heart in San Juan, Puerto Rico. During his years as an undergraduate, he was involved in Research Experience for Undergraduates (REU) in the Department of Chemistry at the University of Puerto Rico–Rio Piedras isolating and analyzing soil samples that contain novel fatty acids with potential medicinal applications. After graduation, he worked in the Chemical Technology Division at Argonne National Laboratories in Chicago. Tormos Melendez earned an M.S. and a Ph.D. in Chemistry at the University of Iowa, where he used enzyme kinetics and isotope effects with UV-Vis spectrophotometry to demonstrate the accumulation of a tetrahedral intermediate in the active site of the enzymes acetylcholinesterase, an enzyme found in the neuromuscular junction; and butyrylcholinesterase, an enzyme that has been the target of several nerve agents. As a postdoctoral research fellow, he joined the Department of Biochemistry at the University of Texas Health Science Center at San Antonio. During that time, he established that an enzyme from P. anserina is a nitroalkane oxidase, upgrading the protein from its original classification as hypothetical. Tormos Melendez also used site-directed mutagenesis and enzyme kinetics to determine the structure and the role of specific residues in substrate binding and specificity for the mammalian enzyme polyamine oxidase. As an adjunct faculty member in the Department of Biochemistry at UTHSCSA, Tormos Melendez used X-ray crystallography to obtain the first mammalian crystal structure of the enzyme polyamine oxidase and further study the structural and binding differences among the different polyamine oxidase enzymes. His career goal is to teach and establish his own biochemistry laboratory at St. Mary’s University. 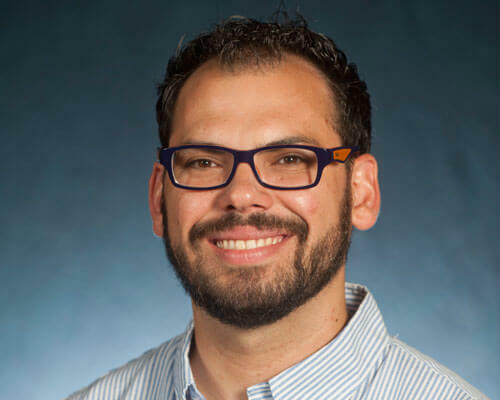 Tormos Melendez enjoys the University’s diverse student population and its interdisciplinary approach to science education through the overlap of different departments and courses to expose students to a broader learning experience in science. Tormos, J. R., Henderson Pozzi, M. and Fitzpatrick, P. F. Arch. of Biochem. and Biophys. ; 2012; (In press). “Mechanistic Studies of Mammalian Polyamine Oxidase: Role of Histidine 64”. Tormos, J. R. Taylor, A. B., Colette, S. B., Hart, P. J. and Fitzptrick, P. F. Biochemistry; 2010; 49 (24), 5035 – 5041. “Identification of a Hypothetical Protein from Podospora anserina as a Nitroalkane Oxidase”. Tormos, J. R., Wiley, K. L., Wang, Y., Fournier, D., Masson, P., Nachon, P. and Quinn, D. M. J. Am. Chem. Soc., 2010; 132 (50), 17751 – 17759. “Accumulation of Tetrahedral Intermediates in Cholinesterase Catalysis: A Secondary Isotope Effect Study”. Wiley, K. L, Tormos, J. R. and Quinn, D. M. Chem-Biol Interact; 2010; 187 (1 – 3), 124 – 127. “A secondary isotope effect study of equine serum butyrylcholinesterase-catalyzed hydrolysis of acetylthiocholine”. Tormos, J. R., Wiley, K. L., Seravalli, J., Nachon, F., Masson, P., Nicolet, Y., Quinn, D. M. J. Am. Chem. Soc. ; (Communication); 2005; 127, 14538 – 14539. “The Reactant State for Substrate-Activated Turnover of Acetylthiocholine by Butyrylcholinesterase is a Tetrahedral Intermediate”.